This was probably the game I was most excited about before I went to the fair. And I'm so happy that my hopes were reasonable. No, let me put this right. This game is actually even more fun than I expected or hoped for. I really love the fact, that this game has - similar to Werewolf: Inquisition - no player elimination at all. It's also cool that one round isn't longer than maybe 10 minutes and after that you get a new role for the next round and it starts over again. Another thing that bothers me about classic Werewolf is the mandatory moderator you need to be able to play the game. One Night doesn't need one dedicated moderator, it's no problem if one of the players calls out every role at night. 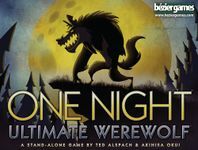 I strongly recommend this game to everyone who likes Werewolf-like games because it brings everything Werewolf has in a condensed and streamlined fashion. Don't miss this! Bang the Dice Game was actually the very first game we played when we arrived at the fair and I have to say that I really like. It seems to play a lot faster than the classic card game since you can not hoard dodge cards - you just get hit. I also like the fact, that you have to use all your dice at any time. So even if you don't want to you still have to shoot maybe even your fellow mate. It just makes sense in the context of a dice rolling game. 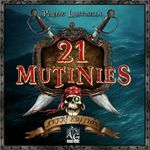 This game was completely under my radar until I saw it at the booth in Essen but it immediately caught my attention with its cool artwork and the pirate theme. The game works pretty well and I personally think that the whole idea of either following the captain when selecting the action you wanna take or to just mutiny to become the new captain yourself just makes complete sense to me. As I said, the game looks really cool: the artwork on the board and the cards is really nice. I really liked it and it was actually one of my personal surprises. 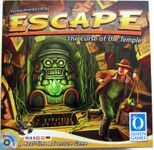 Escape was also one of the surprises for me at Essen. I heard about this game and I've seen it played before but honestly, I was kinda sceptic about the game itself. It just always looked too chaotic to me. But when we tried it at the Queen Games Booth I have to say that I was really surprised about how much fun the game actually is. Especially the possibilty of sharing dice brings the cooperative aspect of the game to a cool new level. Even though it is a dice rolling game you have to be careful about what everyone on the group does. I was actually kinda surprised about how much a good plan and good communication can increase your chances of winning - even in the context of a completly luck based game. 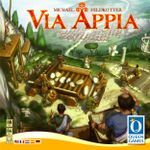 When I saw the Game Night Episode covering this game I was really intrigued by this game and it was one of the titles I put onto the list of games I wanted to check out in Essen. I have to say that I really enjoyed this game when I tried it at the Queen Games booth. Obviously the core of this game is that quarry-mechanic where you have to push wooden disks (representing stones in the quarry) into some kind of horizontal funnel with the goal to push other disks out of it on the opposing side. You can trade those stones for way-tiles of different kinds or coins afterwards. I was kinda concerned, that the rest of the game could be "glued" around that unique mechanic. But thankfully that was not the case - at least not for me. The game felt really good, even if you took one of the other actions beside the quarry. I didn't pick it up but I'm really happy, that one of my friends did. I'm looking forward to playing this again soon. 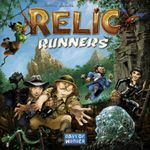 Relic Runners was one of my most anticipated games of the fair and I was pretty stoked when we finally got a spot at one of the tables at the Days of Wonder booth.